English cherries: Interlopers on the whole, encouraged here by a pre-UKIP Henry VIII who had enjoyed the sweeter fruit of Flanders and demanded that orchards be planted in Kent to satisfy his sweet tooth. For me, their immigration status is irrelevant. They are just one of my favourite drupes. A chopstick, a wine bottle (email me for more details on this devious technique) and hours of fun pitting the little blighters and I proceed to jam, a pie but most of all that jammy sweet sour saucy thing with a juicy duck breast. Cready Carver is my preferred duck. Sold in packs of two (sigh) at Provenance, my local butcher, I always just cook off both. The second will make it into a Mie Goreng later this week. But here’s a classic…spoiling for one, but if I don’t, who will? Thermomix – place the steamer basket in the bowl over 150ml of water. Place in the celeriac and steam Varoma/20mins or until tender. Empty the bowl of water and remove the basket. Place the cooked celeriac in the bowl with 25g of butter and blitz 1min/speed 9. Taste and season and keep warm on 40C/Speed spoon until ready to eat. Non-Thermomix – steam the celeriac over water until tender and mash or puree with a stick blender. Season to taste. Keep warm over in a bowl over the steaming water until ready to eat. For the duck, score the fat in a criss cross pattern with a sharp knife, being careful not to cut through the flesh. Season the skin with a little salt, and place the breast skin-side down in a cold pan over a high heat. As the skin begins to sizzle, reduce the heat until most of the fat has rendered away. Turn the duck over and brown for a minute. Pour off the duck fat and add the onions to the pan with a little water. Place in the oven for 15 minutes. Meanwhile, make the cherry sauce. Add the stoned cherries to a pan with the sugar and allow to sweat over a medium until the juices run. Raise the heat and add the red wine. Allow to reduce until syrupy and add the stock and vinegar. Reduce to a sauce consistency and taste. Add more sugar or vinegar to taste. 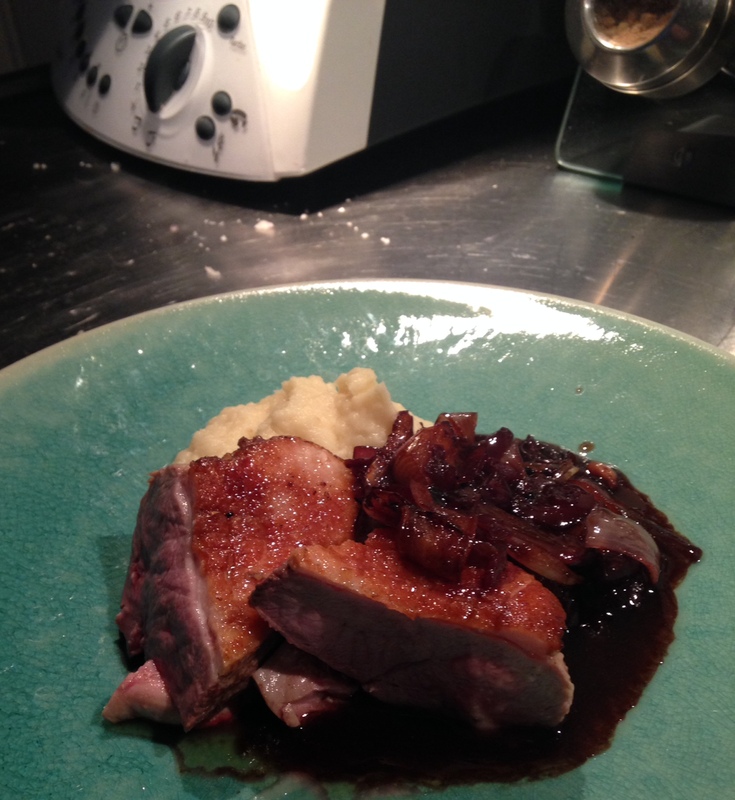 Slice the duck into two, and serve on warmed plates with the celeriac puree, and the sauce. Loved your idea, will surely try!